Nutrition Month 2017- Take the Fight out of Food! Do you ever get frustrated by food and nutrition? Maybe you can’t figure out why you feel bloated after eating certain foods, have family mealtimes that are mayhem or are unsure about which foods are best for a particular health condition. I call these “food fights” – they represents times when you struggle with yourself or others about what to eat. Part of my job as a dietitian is to coach people to calm these food fights, so I was super excited that the Nutrition Month 2017 theme is “Take the Fight out of Food” – it’s exactly what I do every day! Here at the #domesticphd we passionately believe in eating in moderation and enjoying the foods you love with the ones you love! Eating is essential to provide us with the nourishment our bodies need. Eating is a routine so ordinary in our busy days that it can often be taken for granted. But eating is so much more. Eating together provides us with the opportunity to share, learn, teach and create new and strengthen old(er) relationships. Read on to learn about the benefits of eating together! I went to an interesting talk a couple of weeks ago about the human gut microbiota by Dr. Emma Allen-Vercoe, an associate professor of molecular and cellular biology studies at the University of Guelph. What exactly is the gut microbiota you ask? The gut microbiota houses a community of tiny microbes (e.g., bacteria) that have set up shop inside our intestines. But bacteria are bad you say? Not necessarily. If you are not convinced I hope you will be by the end of this post, as I will share with you some interesting tidbits I learned from that evening. 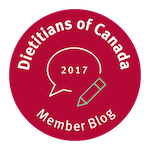 Health Canada is revising the Canada's Food Guide and they want input from YOU! Health Canada has acknowledged that our current food guide needs updating. It is a busy week over here for the DomesticPhD, as it is crunch time for grant and scholarship writing! Kathryn and I often send each other links to articles that we read online that we find interesting. Whether we agree with the content or not it, it engages us to think critically about current trending topics in the media. For this week we thought we would round up some of articles we have sent to each other recently to give you some food for thought! Today's side-dish topic is one that may make some feel uncomfortable to discuss, but it's an important topic to tackle! So let's just put it all out there: Nausea, indigestion, upset stomach, diarrhea, constipation (I'm hearing the Pepto Bismol jingle in my head at the moment while writing this). As a dietitian I often get asked about the latest food trends or what the best foods for a person to eat are. Society has set us up for this question. Between commuting, after work (or school) commitments, spending time with loved ones, hitting the gym and catching some zzzz's after a few episodes of Netflix, there is little time left to sit down and eat a meal. And food marketers are capitalizing on this time crunch, highlighting health claims (which are often questionable) on their package fronts. And so, I am not surprised when people want to get the 'best bang for their buck' while trudging through the grocery store aisles with the latest media headline replaying in their mind. I have always dreamed of being on the CBC. CBC radio has been my backdrop on busy Mondays, in slow traffic on Wednesday afternoons and lazy Sunday mornings at the cottage. Listening always got me thinking about what it would be like to share my research with Canada. And early Tuesday morning, I got the chance to do just that! There has been a push for nutrition labeling to include information distinguishing natural sugars (naturally occurring in foods such as fruit and milk) and added sugars, as currently, only total sugar is listed. Much to the dismay of many, it appears that the changes will only include adding a percent daily value for sugar (including a comment at the bottom stating that <5% would be a low amount and >15% would indicate a high amount of sugar in that food item) and grouping sugars together (to help individuals identify unknown sources of sugar). Today is March 16th. Today is also a very special day. Not only is today the day before St. Patrick's day, it is also Dietitian's Day; a day that officially celebrates all of the hard work that my colleagues and I put into getting the Registered Dietitian (RD) credentials, and helps bring awareness to what an RD is and what they can do to help you reach your nutrition goals.